There are loads of studies showing a relationship between diet and ADHD symptoms. Of course poor diet and eating habits do not cause ADHD, but there is a connection between the kinds of foods children eat and their behavior and symptoms. This is true whether a child has ADHD or not, but may be even more true of children who have ADHD. Let’s look at the biology of ADHD. ADHD is caused by neurological, brain chemistry differences. There are millions of neurons densely packed into various regions of the brain, with each region responsible for particular functions (e.g. motor cortex, visual cortex). For the regions to do their jobs in a coordinated way they must link to other regions, with extensive “wiring” carrying information from one region to another along neural circuits or pathways. Information is transmitted along neural pathways via the action of neurotransmitters. Each neuron produces tiny quantities of different neurotransmitters that are released into the space that exists between neurons (called the synapse), stimulating the next cell in the pathway – and so on down the line. It’s kind of like a series of dominoes cascading down a line, but with the fall of each domino triggered individually. In ADHD, there is a deficiency of one or more neurotransmitters in the brain. There are three subtypes of ADHD: inattentive type, hyperactive/impulsive type, and combined type. We believe that inattentive ADHD is linked primarily to deficiencies in the neurotransmitter norepinephrine, hyperactive-impulsive ADHD to deficiencies in dopamine, and the mixed type of ADHD with altered choline transporter genes. In addition, the emotional dysregulation (e.g. impulse control and aggression) aspect of ADHD is linked with a serotonin transporter gene. How would different foods and nutrients affect ADHD brain chemistry? Let's look at the main categories. Bad Carbs and Sugar: The rate at which sugar from a particular food enters brain cells, and other cells of the body, is called the “glycemic index." Foods with a high glycemic index (e.g. sugar and bad carbs like pastries) stimulate the pancreas to secrete high levels of insulin, which causes sugar to empty quickly from the blood into the cells. 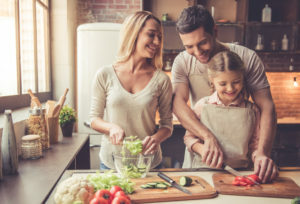 This gives the child a nice dopamine “rush” and may be one reason children with ADHD crave carbs and sugar – their bodies may (in effect) be trying to “self-medicate.” The rush of energy is, however, short-lived (1-2 hours). As blood sugar drops, the child plummets from peak energy to trough, and may get irritable, sleepy, and be less able to focus. Their body may crave more sugar to get the rush back. It can become quite a hormonal roller coaster. Plus ADHD and obesity are linked (probably though this process combined with weak impulse control) so you want to try to avoid letting your child get “addicted” to sugar and bad carbs. Suggestion: Shift to foods that have a lower glycemic index. Say “yes” to most fruits and vegetables, beans, steel-cut oats, low-fat dairy foods, and nuts. Say “no” to candy, white bread, rice cakes, most crackers, bagels, cakes, doughnuts, croissants, and most packaged breakfast cereals. Protein: Proteins affect brain performance by providing the amino acids from which neurotransmitters are made. Proteins also produce the amino acid tyrosine which, in turn, produces dopamine and norepinephrine – two areas of deficiency in ADHD. In addition, sugars from carbohydrates are digested more slowly when they’re consumed with protein, resulting in a more gradual and sustained blood sugar release. Suggestion: Add plenty of protein to your child’s meals. Iron: Since certain proteins (meat, fish) have the highest concentrations of heme iron, I’ll address iron next (if your child doesn’t eat meat or fish there are other sources). Iron is a cofactor for tyrosine, the rate-limiting enzyme of monoamine synthesis, so it regulates dopamine production. A 2017 review and meta-analysis of studies on ADHD and iron found that serum ferritin levels are lower in many children with ADHD than in healthy controls. For these children, iron supplements can improve ADHD symptoms. Suggestion: Add more iron-rich foods to your child’s diet and/or consider giving an iron supplement. I advise that you do a ferritin test first to see if your child actually does have low iron before giving supplements. Zinc: After brain cells release dopamine into the synapse, they “vacuum” it back up using a dopamine transporter. Zinc binds to the dopamine transporter and slows it down, allowing dopamine to remain active in the synapse for a longer period of time before being pulled back into the cell to be recycled. Thus, zinc is a natural dopamine reuptake inhibitor. Ritalin also inhibits the reuptake of dopamine (but less naturally). Lower levels of zinc have been reported in some children with ADHD. While I found a few solid studies that looked into the effects of zinc supplements, two showed improvement and two showed no effect. (1) I hypothesize that the children who benefited may have been those who had a zinc deficiency to start with. Suggestion: Have your child’s zinc levels tested, and if they’re low, consider zinc supplements and/or adding zinc-rich foods to your child’s diet (red meat, poultry, pumpkin seeds, chickpeas). Suggestion: There’s modest potential for a benefit from giving your child fish oil. Amino Acid Supplements: The amino acids phenylalanine, tyrosine and tryptophan are used to make the neurotransmitters dopamine, serotonin and norepinephrine. Among the few studies examining how amino acid supplements affect ADHD symptoms, some show modest benefits, and some don’t show any. Amino acid supplements taken by mouth are considered to be “possibly safe” when taken on a short-term basis (up to 6 months) due to potential side effects including fatigue and loss of coordination. Suggestion: Because of the risks and uncertainty of benefits from such supplements, go to the source and provide amino acids naturally through foods including: red meat, dairy products, whey, milk, soy proteins, chicken, fish, and eggs. Elimination Diets: An elimination diet is a short-term eating plan that eliminates foods that may be causing allergies, sensitivities, or other digestive reactions – then reintroduces the foods one at a time in order to determine which foods are, and are not, well-tolerated. While it’s tough to implement this kind of strict, restrictive diet and closely monitor the results, the information gained can be helpful. The incidence of asthma, allergies, and skin infections appears to be higher among children with ADHD than those without. Children with food sensitivities can feel tired, itchy, nauseated, and have trouble focusing or difficulty controlling their emotions when they eat foods that don’t agree with them. Finding out which foods trigger these kinds of reactions and eliminating them can improve symptoms. Food dyes, milk, and gluten, are common culprits. The best synthesis of studies I found in this area is by one of my favorite ADHD researchers, Joel T. Nigg (3) He found statistically significant ADHD symptom reduction when children were given a narrow diet of foods unlikely to cause reactions. Suggestion: If you suspect your child has food sensitivities and you have the discipline to test your hypothesis through an elimination diet, go for it! In sum, I feel the evidence does suggest that dietary changes can help some children with ADHD symptoms. I've gotta say - that is one thing Brain Balance centers get right. But you don't need to pay them over $10,000 to tell you that! (1) Hariri, Mitra and Azadbakht, Leila. "Magnesium, Iron, and Zinc Supplementation for the Treatment of Attention Deficit Hyperactivity Disorder: A Systematic Review on the Recent Literature." International Journal of Preventative Medicine, 2015: 6:83. (2) Bloch, Michael H., and Qawasmi, Ahmad. "Omega-3 Fatty Acid Supplementation for the Treatment of Children with Attention-Deficit/Hyperactivity Disorder Symptomatology: Systematic Review and Meta-Analysis." Journal American Academy Child Adolescent Psychiatry. 2011 Oct; 50(10): 991–1000. (3) Nigg, Joel T., and Kathleen Holton. “Restriction and Elimination Diets in ADHD Treatment.” Child and Adolescent Psychiatric Clinics of North America, vol. 23, no. 4, 2014, pp. 937–953.